Audi India has launched the 2017 A3. It is priced at Rs 30.5 lakh for the petrol version (35 TFSI) and Rs 32.30 lakh for the diesel (35 TDI) (all prices, ex-showroom, New Delhi). It is the mid-cycle update of the sedan, which is based on the third-generation A3 hatchback (not available in India). 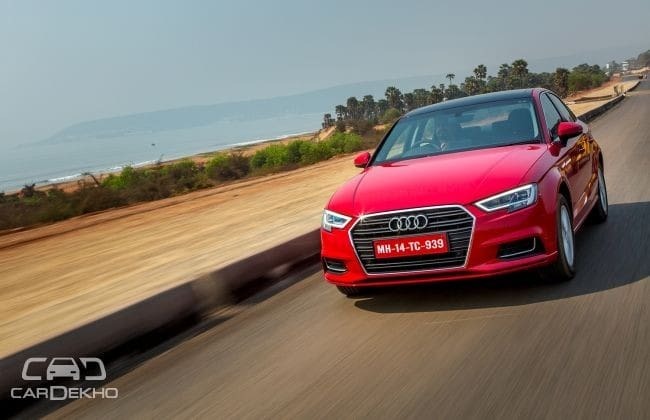 Technically, this is the first ever update of the A3 sedan since the last two generations of its hatchback counterpart didn’t offer sedans based on them. Last year, Audi celebrated 20 years of the A3 moniker, of which the automaker has sold more than four million units until now. The A3 sedan made its world premiere at the 2012 Geneva Motor Show as a concept, and was launched in India in 2014. Further, this updated model made its global debut in April 2016 and went on sale in the following month in Europe. As of now, the Mercedes-Benz CLA (facelift was launched in India in November 2016) remains its prime opponent in India. And if you consider its price band, the A3 sedan goes up against the BMW 1 Series, Mercedes-Benz A-Class and the Volvo V40 range as well. Also, the updated cabriolet version of the A3 was launched in February in the country. At the front, the A3 facelift gets Audi’s latest Singleframe grille, which is broader and features sharper contours than the previous one. The new headlights are sharper as well, notice the kink in the lower section that resembles the one on the new A4. Audi’s Xenon plus units are standard in the updated model (no more multi-reflector halogen headlamps for lower variants), while you can also opt for full-LED headlamps. Internationally, the A3 can also be had with Audi’s Matrix LED headlamps. The side profile remains identical to the previous model, save for the new set of 16-inch alloy wheels. At the rear, it gets new graphics for the tail lamps and a subtly restyled bumper. Though the tail lamps feature the same profile, what you get now is new LED graphics along with Audi’s dynamic turn signals. On the inside, it gets a new three-spoke steering wheel, which has been lifted straight from the India-bound Audi Q2 compact SUV. The infotainment system now comes with Audi's latest MMI unit. It also gets the Audi phone box, which is placed in the centre armrest and improves smartphone connectivity through the vehicle’s antenna and supports wireless inductive charging as well. Besides these, rest of the features and cabin elements have been carried forward in the updated model. The international version also comes with Audi’s virtual cockpit – 12.3-inch all-digital instrument cluster similar to the new A4 – which has been given a miss in the Indian market. The 2017 A3 gets a new, downsized petrol engine in the country, which is slightly less on power but improves the overall fuel efficiency. The engine we are talking about is a 1.4-litre TFSI turbocharged petrol motor replacing the 1.8-litre turbo mill. It puts out 150PS of max power (a drop of 30PS), but the peak torque remains the same at 250Nm, and is mated to a seven-speed DSG automatic gearbox. This motor also features cylinder-on-demand tech, which turns off two of its cylinders when the corresponding output is not required, primarily for fuel efficiency. Result: the overall efficiency has gone up by nearly 3kmpl at 19.2kmpl. The diesel, on the other hand, remains the same – the 2.0-litre TDI (143PS/320Nm) – and is coupled to a six-speed DSG automatic transmission.